For two decades, American officials have been nagging allies to stop cutting their defense budgets and despairing that European leaders would ever again pay their share of NATO costs. President Obama is taking the same message to the NATO summit that opens Thursday in Wales. But this time—thanks to Russia—the White House hopes that spending trends will be reversed. Defense Secretary Chuck Hagel, who will join the president in Newport for talks with the other 27 NATO allies, has called Russia's seizure of Crimea and intervention in eastern Ukraine "a clarifying moment" for the 65-year-old alliance, disputing the theory that there was no military threat to the continent. "Russia's actions in Ukraine shatter that myth and usher in bracing new realities," Hagel said in an earlier speech at the Woodrow Wilson International Center in Washington. A similar message was delivered Saturday by Anders Fogh Rasmussen, NATO's outgoing secretary general. In an interview with CBC Radio in Canada, Rasmussen said Russia's aggression in Ukraine has ended the "relatively calm weather" enjoyed by Europe over the 25 years since the Berlin Wall fell. "We have lived in a relatively quiet security environment," he said. "But the crisis in Ukraine as well as what we're now seeing in Iraq [and] North Africa is a wake-up call." He likened NATO to security insurance for the continent. "And for an insurance you pay a premium. Now the premium has gone up because of this unstable security environment," he said. At issue is the long-standing but widely ignored NATO pledge by each member state to spend at least 2 percent of its gross domestic product on defense. Today, only four members meet that goal—the United States, at 4.4 percent; the United Kingdom, at 2.4 percent; Greece, at 2.3 percent; and Estonia, at 2.0 percent. If anything, the situation is worse than those numbers suggest since much of Greece's military spending is aimed at domestic defense against another NATO member, Turkey, and is of little use to the broader alliance. In Tallinn, Estonia, on Wednesday, Obama had two objectives: to reassure the Estonians that NATO will defend them and to set the increased spending as one of his top goals in Wales. The reassurance came in ringing tones as he called the defense of Tallinn and Riga and Vilnius "just as important as the defense of Berlin and Paris and London." He spoke the words the Baltic nations wanted to hear about Article 5 of the NATO charter, which declares that an attack on any one member is an attack on all. If the Baltics are attacked, he pledged American aid, stating: "We'll be here for Estonia. We will be here for Latvia. We will be here for Lithuania. You lost your independence once before. With NATO, you will never lose it again." His talk of defense spending was less ringing. "We need to keep our alliance strong for the future," he said. "And that means investing in capabilities like intelligence and surveillance and reconnaissance and missile defense." He did not mention it, but those were the precise capabilities that were found lacking when NATO launched its military operation in Libya in 2011. Obama added, "This week's summit is the moment for every NATO nation to step up and commit to meeting its responsibility to our alliance." This, said the president, "is a moment of testing" for the alliance. He did not say why anyone should expect the allies to pass the test today when they have failed it so miserably in the last two decades. But Charles Kupchan, senior director for European affairs at the National Security Council, said the fresh hope is because of Russian operations in Ukraine. 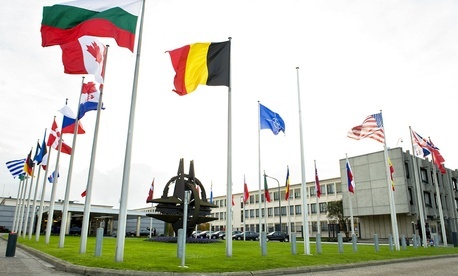 "In light of what is happening in Europe," Kupchan said, "in light of the fact that Article 5 defense guarantees are more salient today, more urgent today, than they've been at any time since the end of the Cold War, we are reasonably optimistic that we will get agreement among the 28 allies to rally behind a commitment toward increased defense spending." At risk is the effectiveness of the alliance, according to administration officials. Then-Defense Secretary Robert Gates put it bluntly in his final European speech before leaving the Pentagon, warning that NATO could suffer "collective military irrelevance" without more spending. After so many years of vain calls for members to meet the 2 percent threshold, analysts anticipate a change in focus at this year's summit, with less talk of 2 percent and more talk of increasing spending on specific alliance needs. "The question is whether that benchmark matters anymore, whether it makes sense," said Kathleen Hicks, director of the International Security Program at the Center for Strategic and International Studies. She called the 2 percent benchmark "increasingly irrelevant" and said the focus in Wales would be on the specific initiatives to be promoted, many of which come out of the lessons learned in Libya. Heather Conley, director of the Europe Program at CSIS, said the 2 percent figure is unimportant if, like the Greek spending, it doesn't benefit the whole alliance. "It has to be meaningful," she said. "It has to be purchasing NATO interoperable equipment that can be used both for collective defense but also for crisis management." In many ways, this will be the "key debate" of the Wales summit, argued Jeremy Shapiro, who was assistant secretary of State for Europe and Eurasia in Obama's first term and now is at the Brookings Institution. Lamenting that "European defense spending has really fallen off the cliff since the financial crisis began in 2008," he said Obama does not want to leave Wales without a commitment to turn that around. "This is going to be a very hard sell," Shapiro warned, adding: "This is the way that the success of the summit should be assessed."